I can t leave out the 1$ panorama camera results from this Hong Kong panoramic series, right ? Ansco Pix Panorama with ERA 100 bw film. Yes, the the panoramic outing to Hong Kong with the Seitz Roundshot 28-220, the Noblex 135 and the Ansco Pix Panorama. The first visit to Hong Kong this year. I like to explore the city even I came here already 5 times last year. The diversity and sounds and sights are great. Best time to come here, not too cold not too hot. And the Noblex makes her "rounds" with me ! Another set of Anso Pix Panorama pictures from Shanghai using the chinese Lucky 200 colornegative film. Thats pretty grainy, dont think gonna replace my Velvia 50. 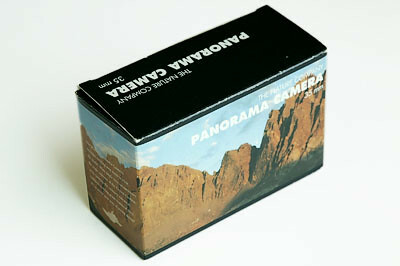 In my quest on collecting panorama cameras I came across the Supersampler panorama camera from the Lomo hype company. 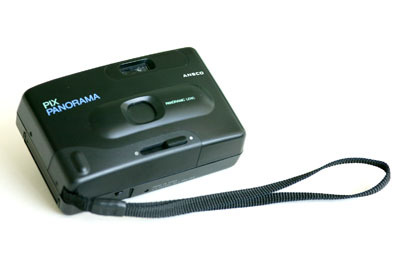 Its a piece of plastic that shoots 4 panorama shaped images on 1! piece of 35mm 24x36 frame. And it comes for the hefty price of 40 to 50 U$ ! Excuse me ? 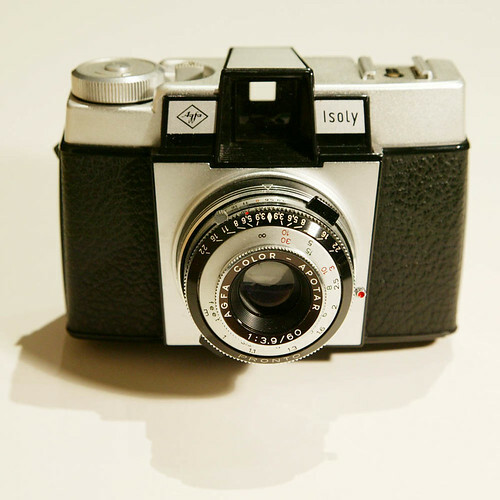 I always thought lomography is a photographic artform not a trademark, but after further investigation I found out that "lomography" is a trademark by an austrian company that bought it from Russia. Nope. Not with me, I will not follow this plastic hype, but create my own style of cheap cameras with a certain art style. I will update you on that. PS: I bought the supersampler on ebay for an "ok" price to get the collection complete ! During my last trip I explored the very basics of panorama photography. 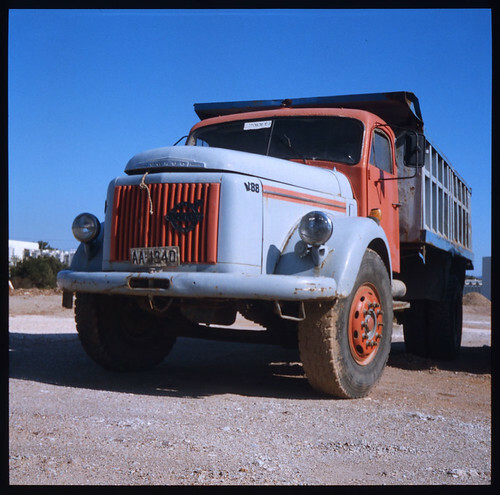 Using the chinese bw film ERA in a Ansco plastic panorama camera with fix 1/125, f11 and fix focus. I used occasionally my lightmeter, I must admit that trains your light sensitivity ! The camera is handy, almost zero weight. I paid more for the development of this film than for the film and the camera together ! This is not about fancying cameras or trash photography. Its about seeing ! 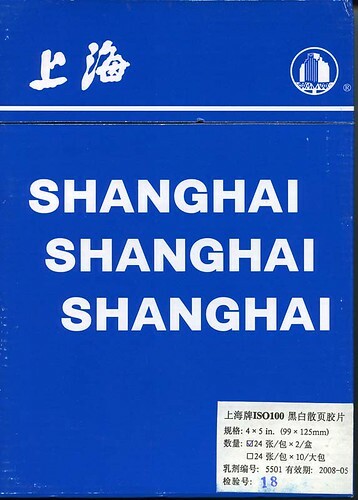 During my second visit within 4 weeks to Shanghai, I decided to hunt for the bw film brand i only heard of before: "Shanghai". Same location, "Xing Guang Photographic Center". I found a shop only selling large format equipment - How do they survice ? - having stock of these brand. I bought 2 boxes, 80 RMB each (about 8 Euros), each box contains 48 sheets. Also get another four 4x5 film holder. Next weekend will do some test shots and enlighten you with the results. 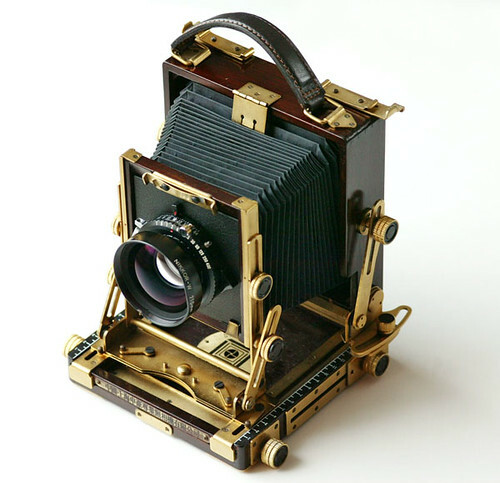 The latest addition to my collection, a large format field camera (4x5 inch) from the chinese manufacturer Shen Hao (see link). I bought it used with a Nikon W 210mm/5,6. Seems this model is no longer available. My treasure shows some traces of use but after using some wood wax and brass polish, its a pleasure to use and look at. Next satruday I will source for "Shanghai 4x5 film" in Shanghai. A local contact told me the price for one box with 50 sheets is 80 RMB. Lets see. As soon I am able to use it I will update you with some stunning large slides. Latest addition to my panorama camera collection. Maybe the cheapest, I bought for 1U$ and got it shipped for another 10U$ ! The Ansco Panorama camera, a piece of plastic from the pre-Holga era, with fix focus, 1/125 and f11 exposure uses 135 film and mask to 13 x 36mm. This specific model was packaged by the Outdoor Company. Ansco does not exist any longer, the factory was torn down around 2001. This camera was made in China anyway, from some recherches in the web it seems Haking Ltd in Hong Kong bought once the name for the consumer market products. 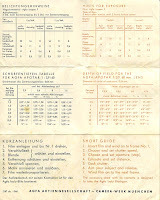 Will dont spare you from experiencing some Ansco panoramics soon. 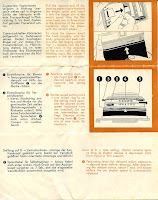 More info: The old company Ansco does not not exist anymore (see link Ansco Chronolgy by William L. Camp), also the name is no longer used for an actual product. The HP 122 (see link at Haking website) still looks a bit like the Pix Panorama !